I've tried quite a few sticker organizational methods over the years of planner decorating. From using clear protective sheets to a boatload of washi tape to hold down all my individual sheets, I've tried most of the methods out there. Using an accordion file is by far the best way I've found to store planner stickers. I received my accordion file as a gift from a subscriber, but you can find them on Amazon (like this similar one) or the Container Store if you're blessed/cursed to have one close to you. In today's video I show my sticker categories, but ultimately you'll want to divide up your collection into whatever sections that make sense to you. Have a lot more stickers than I do? Have a separate accordion for kits functional stickers, and decorative so it doesn't get overwhelming. Plus you can always have an "on the go" case for the stickers you use most often. 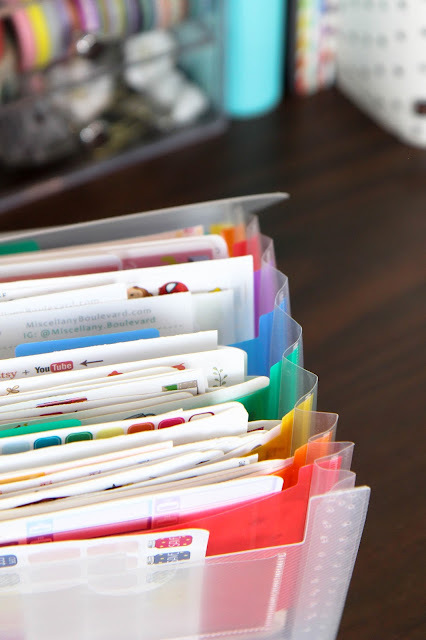 How do you store your stationery supplies?